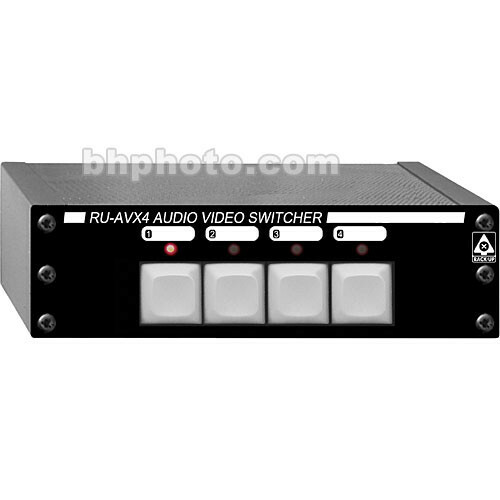 The RU-AVX4 from RDL is a compact, rack-mountable, professional-quality 4-channel audio/video switcher. It offers gold-plated RCA phono connectors for all inputs and outputs, allowing a variety of devices such as VCRs, DVD players, or CD players to be connected. All source selection uses solid-state switching for increased reliability. Each source has a front-panel pushbutton selector and an accompanying LED to signal which source is currently selected. A terminal block connector is provided on the rear-panel for remote control of the unit. Box Dimensions (LxWxH) 7.0 x 4.0 x 2.5"